THEN: With his or her back to the east shore of Lake Sammamish an unidentified photographer recorded this Monohon scene in about 1909, the date suggested by the Eastside Heritage Center, by whose courtesy we use this historical record. NOW: On the evidence of plat maps, a railroad station footprint, and Monohon historian Phil Dougherty, Jean Sherrard is very close to the position taken by the historical photographer. 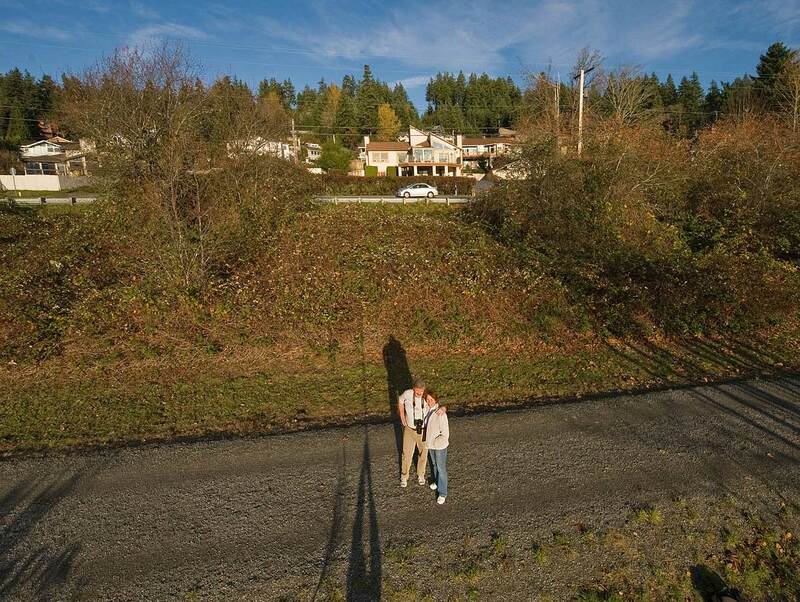 He has also raised his camera high and looks across the old railroad bed, now a recreation path, to the E. Lake Sammamish Parkway SE, near SE 32nd Street. He includes his shadow. “Charming” is a word that might have dropped upon or from you when first you looked at this week’s garden scene. 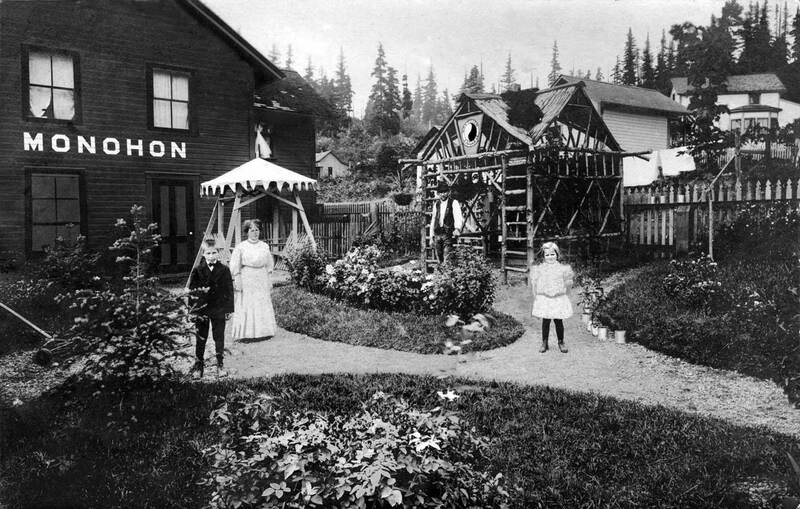 This is the gated garden at the Monohon – spelled with three “Os” – railroad station, a mill town on the southeast shore of Lake Sammamish. Perhaps that is the station master’s family, standing in the garden path. Or it may be the gardener’s kin posing with a worker who may be the gardener himself, and who stands near the scene’s center. Above him and posted to the garden’s rustic gazebo is a small ying-yang, the traditional Chinese symbol for “unity in duality,” which the Northern Pacific Railroad has stretched somehow to represent steam locomotion. The railroad bed is on the other side of the gazebo and picket fence. When the NP’s predecessor, the Seattle Lake Shore and Eastern Railroad, started laying track into the hinterlands from the Seattle waterfront in 1887, it opened King County to both settlement and the development and export of principally coal, lumber, and produce. The rails reached the eastside of Lake Issaquah in 1889, inspiring a lumber mill on the trackless west side of the lake to packed-up it saws and moved over to Monohon. It was just in time to help rebuild Seattle after its “great fire” of that year. Monohon mostly prospered until 1925 when it was swept by its own “great fire.” and, except for vestiges, both the mill and the town were destroyed. Of course, Monohon history is much more detailed than this, and fortunately historylink historian and “east-sider” Phil Dougherty has posted a thumbnail history of the mill town. It is essay no. 7780 on that on-line encyclopedia of state history.